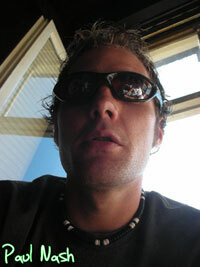 Paul is the most recent rider to join Team Flipside, we originally met him in 2003 before the Airborn Contest. Paul claims to "not be happy until i have noseslid everything in the park" whenever he skates and will hit them in the most awkward of places that the rest of us wouldn't even think of skating. 2007 has seen a year of big improvements for Paul, skating with the crew most weekends around the country and placing 1st in AM at the St. Albans Rolling Dead contest and third overall in AM at the UK Nationals in Birmingham. Once credited for getting cramp in his thigh a lot (see Crescent Fresh Antics ;) ) he seems to have put those days behind him and now spends weekends partying, then skating whilst feeling like "i'm hanging out of my arse" and booking hotel rooms for events and then not staying in them. If you're lucky enough you may one day receive a call from him on his phone in his car steering wheel. Paul Nash - put simply - is a rockstar.